A group of Wildcats celebrate. Northwestern earned a late upset against No. 8 Boston College on Friday but failed to edge No. 4 Duke on Sunday. In a span of 48 hours, the Wildcats tasted both ecstasy and agony on the field. No. 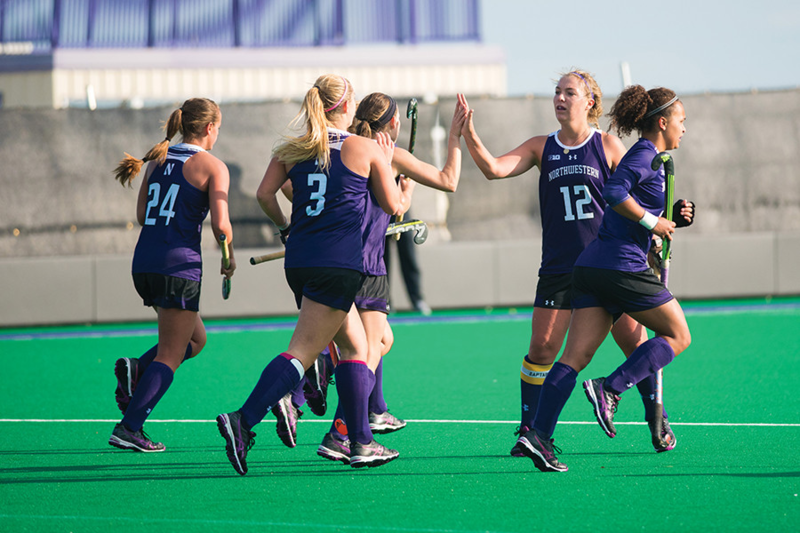 16 Northwestern (2-2) scored with no time remaining Friday to spring a 2-1 upset on No. 8 Boston College (1-2), but failed to repeat the feat Sunday in a 3-2 overtime loss to No. 4 Duke (4-0). The Cats saved their best work against the Eagles until very late, leveling the score at one on junior midfielder Elena Curley’s goal with fewer than eight minutes to play before redshirt freshman back Kirsten Mansfield scored the winning goal with zeroes on the clock. Mansfield’s goal, the first of her career, came on the fourth successive penalty corner NU earned after time had expired. The Cats were the better team statistically, notching 21 shots to Boston College’s 15 and holding a 10-7 edge in shots on goal. And NU earned 11 corners while holding the Eagles to a paltry one. Despite the statistical superiority, the Cats trailed at the break and did not lead at any point in the game until the very end. Sunday’s game had similar late fireworks, including an NU goal with under two minutes left in regulation, but the undefeated Blue Devils ultimately prevailed. Junior forward Pascale Massey started the Cats off on the right foot with a goal inside the first three minutes, but Duke scored twice to take a 2-1 halftime lead and appeared to be on its way to victory as NU pulled senior goaltender Lindsay von der Luft in the final minutes. Freshman forward Saar de Breij had other ideas, however, scoring her first career goal with just 1:20 to play. The late push was ultimately in vain, however, as junior defender Alyssa Chillano scored off a penalty corner 5:53 into overtime to give the Blue Devils the win. The victors outshot NU 22-14, but the Cats earned six penalty corners to Duke’s five. von der Luft made a career-high 13 saves. NU will open its home schedule next weekend with games against Ball State and Colgate.